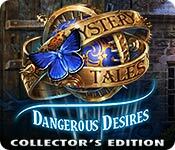 Mystery Tales: Dangerous Desires Collector's Edition is rated 3.1 out of 5 by 22. Rated 5 out of 5 by kimbas from Why the low ratings?! This game is plenty long and has great, challenging, HO scenes and mini games. The graphics are spot on and the map and strategy guide are great. (I love it when a map indicates that there are still collectibles waiting. ) The story line is fine and there's not a ton of back and forthing. You also have the option to play match three instead of HO. The poor reviews don't make any sense to me. Rated 5 out of 5 by fiewi1 from There isn't one thing that I don't love about it! Collect morphing cursed items and coins. Of course you have your very special glasses, through which you see the past. After spotting a "past" scene, you can interact with it. I liked the atmospheric music that was present from time to time to which I always pay attention! Some puzzles were greater than others and I appreciate the fact that you can interchange between the difficult and easier mode for them. The game has an excellent gameflow and suspense! So, kudos! 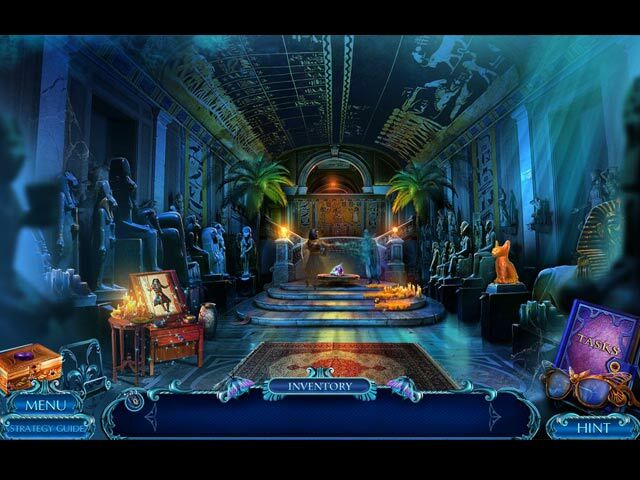 Rated 5 out of 5 by Marja67 from Summoned to the Museum, again. Pretty graphics and appropriate music. Chase after an evil spirit. Use magic eyeglasses. Look for collectibles and also earn achievements. Neat games in between scenes. A must buy. Rated 5 out of 5 by rainworm from Some doctors are a plague…. A voice from the middle ages: ‘somebody as ruthless as me’ cannot be destroyed by mere fire ….’ The burning man at the stake is Moro, accused of practicing black magic and he promises to come back, stronger than ever. We receive a call from our friend Olivia. She is unsure about an artifact, which shall be part of her new exhibition on a plague doctor in the middle ages at the museum. Arriving there, we witness a strange fight between a man on the balcony and his ghostly attacker. The man is thrown into the thicket below. It is Kevin, working with Olivia, he can warn us of Moro before turns to stone. With the help of our special glasses, we may look into the past and see, what happened before Olivia called us and we hurried to the place. In the museum we have to master one barrier after the other, but we find hints: there is Kevin’s note, saying, he cannot help the feeling of being watched by the figurine of Moro. The glasses reveal: Kevin accidentally dropped an urn and out of the broken vessel, Moro materializes. Kevin is immediately attacked and lands, where we found him. Later in the game we will learn more about Moro. But first this old sorcerer has put obstacles in our way. The first hall is guarded by two knights, who won’t grant you passage. Cleverly you may use a cannon, to blow them up. In the hall, Moro has frozen the fountain, doors to other halls are locked and Olivia is nowhere to be seen. Moro was a plague doctor in the middle ages and accused of practicing black magic. When burning at the stake, he sealed away his spirit in his amulet. So now Moro’s spirit has returned, but the amulet is not complete. The crystals, part of the amulet, have been taken out to prevent his return. He needs them back – and we have to prevent it! Full of challenging mini games, variable HOS and special effects the game enfolds the plot at fast pace. Moro is dangerous, as he can turn those to stone, who look him in the eye. 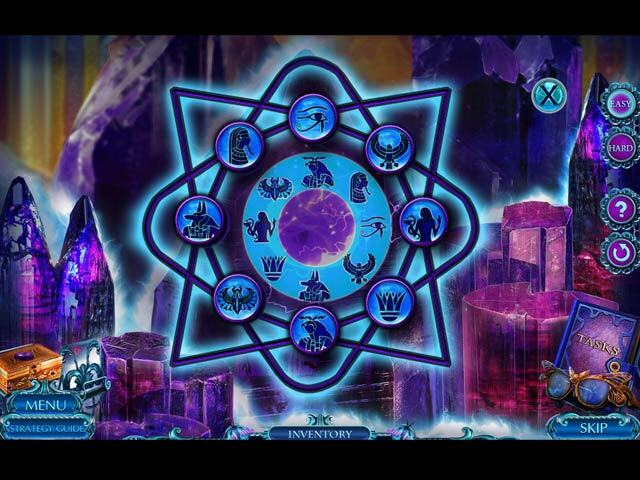 When you come near a crystal, he materializes and is coming up… In addition to a suspenseful gameplay, we have many collectibles, the useful collectible-indicator and of course, we may choose difficulty for the puzzles. The extras offer a replay of HOS and mini games/puzzles. Rated 4 out of 5 by nadaze2da from So its not a perfect game, but how many really are? Contrary to most reviewers, I liked this game overall. Can't say I loved it, but I did find it a fun game to play. The voice acting may not be top notch but the graphics are great. My complaint about the game is that each time an object is picked up there is a little burst of ghostly light which causes a delay. After awhile this became annoying. There were a lot of puzzles but you have a choice to play them on easy or hard. Even on hard, I did not find any of them to be brain drainers. The HOs are interactive lists and I thought there were more of them in the bonus game than in the main story. The story of the bonus game was different from the main game and was fun to play, but it defies logic how a museum curator could be so stupid a second time. Perhaps she didn't see the movie The Mummy. The collectibles and morphing objects were not always easy to find. You have an option at the end of the game to replay the mini games and HOs. You can also buy cursed items with the gold you have collected. This may be kind of silly but it was fun to see what could be bought. The game is not perfect, but how many of them are? I enjoyed playing it in spite of a few short comings. Down load the demo and try it for yourself because that is the only way you will really find out if you want to purchase it or not. Rated 4 out of 5 by Katie318 from Fun to pass time I don't buy a lot of these HOP games, although I've been a Big Fish member for ten years or more. I loved the early ones that made you think, like Ravenhearst and Return to Ravenhurst. Now almost all HOP games have been dumbed down to a non-thinking level, and if you want to play in your sleep, you can use a hint. That said, I recently found myself in the unusual place of lying in a hospital bed due to a foot infection. Eek! Wanting to pass the time, I downloaded this game. It kept my interest. The puzzles were fun. The graphics were colorful. It was not particularly challenging but there were times I scratched my head, wondering what to do next. 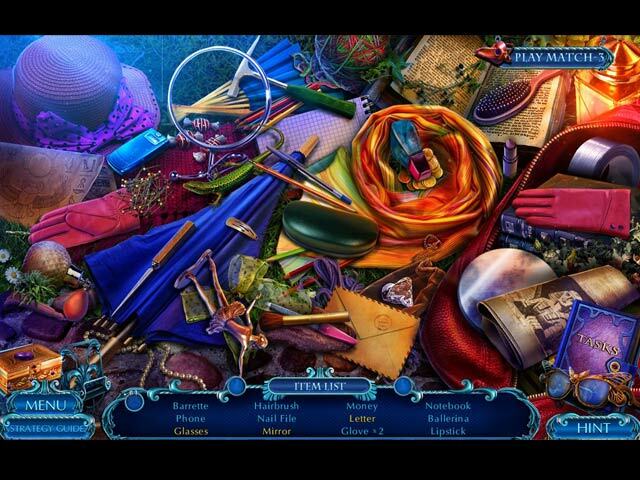 Hidden object searches seem particularly stupid to me, but I tolerated the ones here. I guess the reason I write this review is to dispute some of the frequent reviewers who play and tear apart every game, and look for numbers of hidden object scenes, which puzzles, etc. It is my view that these games are pretty much all the same. When one is in a position to download one, you can shop around but you most probably won't get anything significantly different from the others. Mad Games started off different, then fell into line with the other. Ditto Elephant earlier and many others. Perhaps the genre is getting old, or perhaps one is not really meant to download and purchase every single game offered. Rated 4 out of 5 by dancemom1 from Nice collectibles... Hello friends! And this series just keeps growing. As usual, I review mostly on the game play and leave the story to those who do a much better job than I. The graphics in this game are quite good, except for the blur you have when going in and out of a close up scene. This seems to be a standard with this series and a lot of others. Colors are bright, but tend to have a bit of a blue hue...still nice. Sound FX aren't bad and pretty much throughout the demo. Although they are few and far between, the voices are quite well done, being age and character appropriate. Needed more character interaction. You can click through the dialog if you read faster than they speak, without really missing anything. Game play was excellent, no problems during the demo. Animation was excellent and had very smooth movements. The music was somewhat soothing. Again, we have those silly glasses to see into the past. This gives us more insight into the story, which isn't new, and also allows us to pick up useful items along the way. HOPs are very well done. You have a combination of interactive lists and interactive silhouettes. The scenes are fairly clear and items are not difficult to find. These are well done. You can switch to a match 3 for something different. Puzzles are not all that difficult, but some did take me some time and thought to complete. Hint system is quite useful and actually gives you a hint, rather than telling you to move on. Of course, this is my favorite map, very clear and easy to follow. It shows you the areas where you have missed a collectible, so you can go back and pick it up. The map also automatically opens and shows you where to go, when you need to transport to a longer location. This is very helpful and a time saver, as we do a lot of back tracking in this game. Collectibles are many in this game. We need to find 15 morphing items, which morph very quickly; 51 coins to buy items for the boudoir so watch for them; a lot of diary pages that are not all that easy to spot; and I ran across weapons as well - 15 of them. I accidentally found a couple. Collectibles are nicely done. The story seemed to flow well and was easy to follow, but still was nothing new. I figured out how this would end after speaking with Larry, but I think I need to play it out to see if I'm right. Not sure how I missed beta testing this one. This addition was not all that challenging, except a few puzzles, but I like it well enough to keep going, and I especially like the collectibles. I think all levels of players will find this one worth the CE price. Yes, I am adding this to my every growing collection of CE games. As always, try it for yourself and see what you think. We all have different tastes in games and you may not care for this one at all. Thanks for the reviews.